Garlic Herb Roasted Potatoes - the easiest and delicious roasted potatoes with olive oil, butter, garlic, herb and lemon. No deep-frying easy recipe! Everyone loves potatoes, I mean, who doesn’t like potatoes? Even the pickiest eaters like potatoes, case-in-point: my 4-year old son. While we all love fried potatoes such as chips and fries, the reality is that most people hate deep-frying at home. Deep-frying can be so messy, it wastes a lot of oil, the splatter, but most of all, many people are dreadful of deep-frying and the aftermath such as clean-up. But there are so many ways of preparing potatoes and baking/roasting is definitely one of the easiest options. Recently, I got a bag of small baby potatoes for another recipe and have some leftover sitting on the counter top. I decided to make them into this amazing garlic herb roasted potatoes, a recipe I learned from Gratinee. 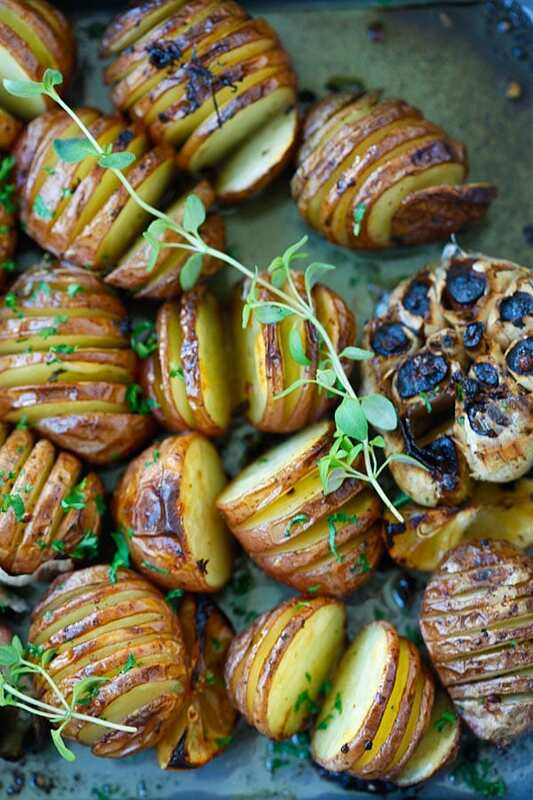 The potatoes are sliced like hasselback potatoes, roasted with olive oil, garlic, butter, parsley, thyme and lemon. It’s really very easy and the only seasonings you will need are black pepper and salt. 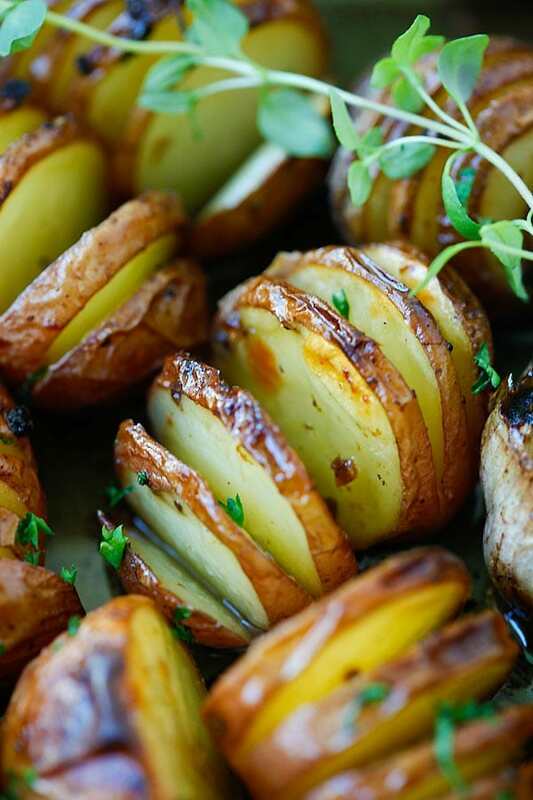 Easy peasy, and after an hour in the oven, magic happens and you have the most amazing, tender, aromatic, and absolutely flavorful roasted potatoes. Gratinee‘s recipe also included roasted chicken, which I should try another time. I really like this garlic herb roasted potatoes; more importantly, my picky eater enjoys them, too. It’s something that I can serve with his favorite Parmesan baked chicken nuggets, garlic sesame noodles, or Parmesan garlic noodles. I made some blanched broccoli for him and he has a complete and healthy meal. 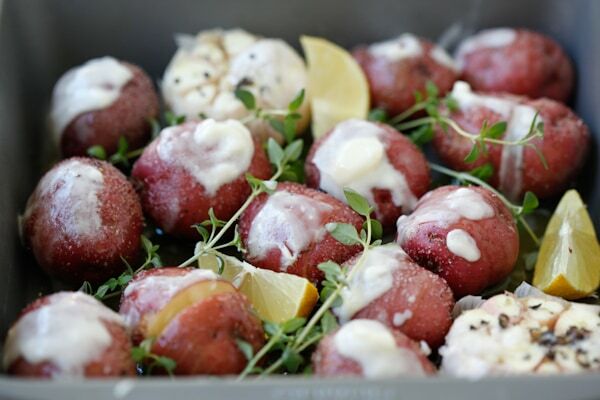 Garlic Herb Roasted Potatoes - baked garlic potatoes with herb, olive oil butter and lemon. 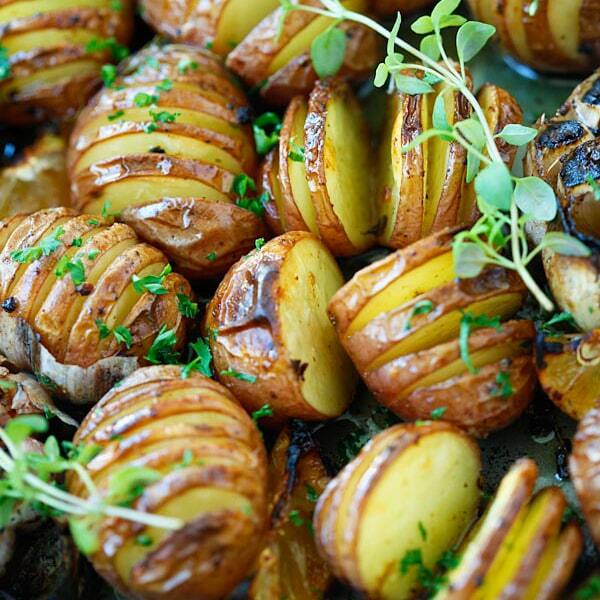 The best homemade roasted potatoes recipe ever. Preheat oven to 350F. Cut slits on the potatoes, do not cut through. 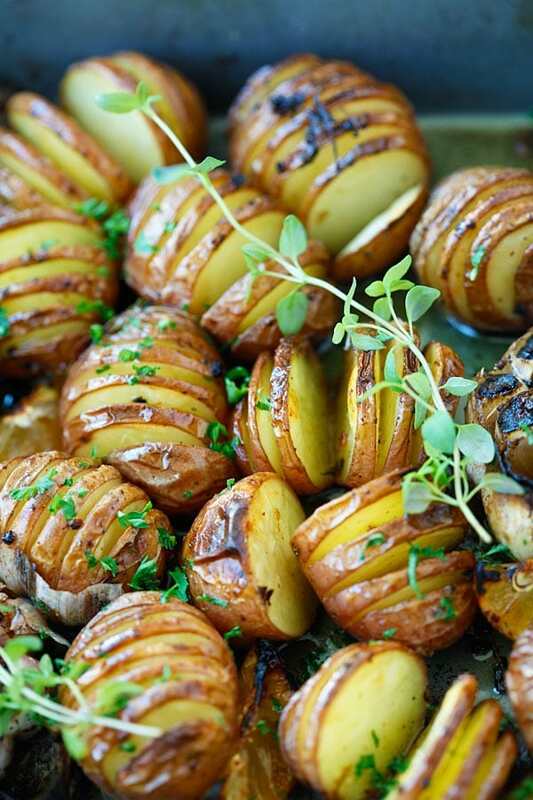 Place the potatoes in a roasting pan and brush with the olive oil and melted butter. Add the garlic, parsley, lemon and thyme in the pan, in between the potatoes. Sprinkle with salt and black pepper. Roast the potato for 1 hour, basting the oil mixture at 30 minute interval. Serve immediately after roasting. All photos and recipes on Rasa Malaysia are copyright protected. Please do not use the photos and recipes without prior written permission. If you wish to republish this recipe, please rewrite the recipe in your own words instead of copy and paste and link back to //rasamalaysia.com/garlic-herb-roasted-potatoes/. Thank you very much! Why is the picture showing fanned potatoes but the instructions saying to not cut through…frustrating to finally see a recipe I want to make but the instructions are different. Not even going to bother. The recipe says to slit the potatoes but not to cut through it so they remain whole but with slits just like how the photos show. It really is not misleading at all. You DO slice the potato in a “fan” but you do not cut entirely through to the bottom. You leave the bottom intact so the potato stays intact, yet fanned so the topping and flavor can get to the potato. It is a great recipe. Wow, how stupid can a Melody T. be? Just found, READ and about to do this recipe for breakfast! There’s no point in being rude “just me.” She just didn’t understand. Why comment if all you have to offer is negativity. Instructions are very clear. Just don’t cut ALL the way through or the potatoes will be single slices not a fanned out potato. 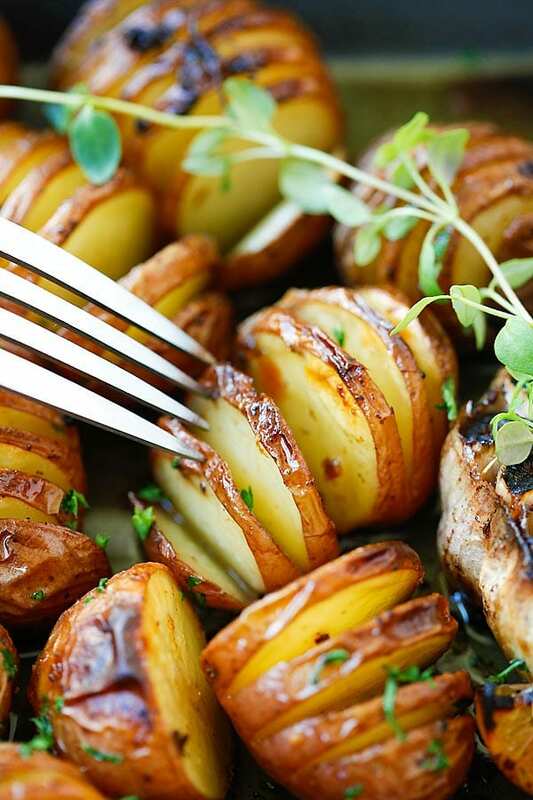 Today I made this recipe for dinner and the potatoes looks nice and the combination with the roasted garlic is like you said, their taste heavenly! And I see many types of potatoes in the market, how can we differentiate them? Yes! You can substitute any fresh herbs for dried the only difference is you will need to use less. So if a recipe calls for 1 tablespoon of fresh simply use 3/4 teaspoon of dried, I hope that helps you! Medium white=thin skin and nice flavor, startch content 1/2 that of russet. Baby red=mild skin can be left on, starch content same as medium white. Excellent for roasting or potato salad. Yukon gold = Yellow flesh excellent flavor starch content same as Russet, makes for excellent mashed potatoes. Can also be used for potato salad. Andean purple =flavor strong as russet starch content high, purples lend themselves to good use as chips. If you want the best results after chopping soak in water for 30 minutes to remove some starch. If you want to mash use extra butter and half-n-half to get a fluffier consistency. Fingerling=delicate flavor can be used in any dish that calls for Yukon gold or baby red potatoes. Can I do the potatoes on the bbq rather than heating up the house? This looks great. 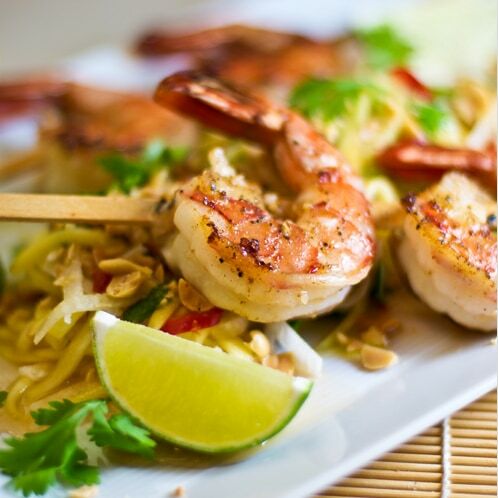 I have all the ingredients in the house now and I am definitely making these tonight to have with salmon. This seems super easy and looks beautiful and how could it not taste amazing? Thanks for this recipe! I made these last night at the fire station where I work. I put the sliced potatoes in a large bowl with the oil, butter, minced garlic, S & P, and laid them on a cookie sheet with parchment paper. I put the fresh thyme on the potatoes. They were the bomb! My guys love garlic and we felt the garlic needed to be on the potatoes not next to them. I’ll make this again this month. Hi Mike, awesome, I am so glad you enjoyed my garlic herb roasted potatoes recipe. Did you also use the rest of ingredients? Or just what you mention, your method sounds great! Laying down a chop stick is a GREAT suggestion!! This recipe looks AWESOME! I’M Making them for 30 people tomorrow for Easter! Rasa, these potatoes are the best! Made them for Easter and they were a complete hit. Thank you for sharing this awesomeness! I want to make these but the recipe is unclear. Do you peel and chop the garlic or peel and leave the cloves whole or not peel at all? Please check the photos and see the photo in the recipe section. The top part of the entire head of garlic is trimmed off. the potatoes had so much flavor!! 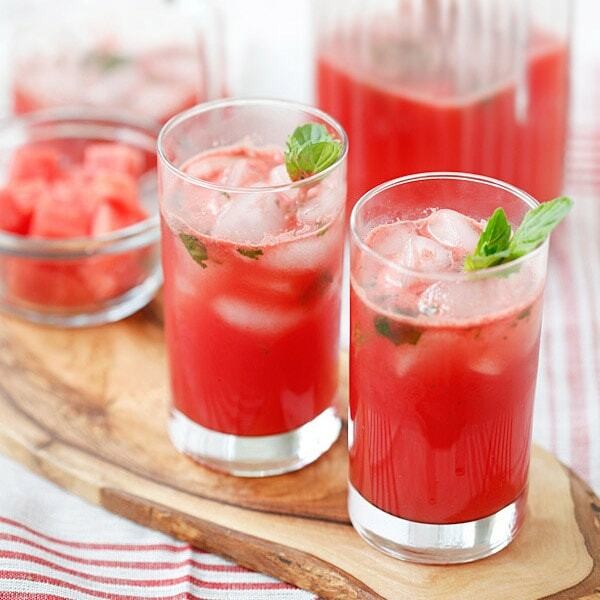 i love this recipe, I will share it with others!! 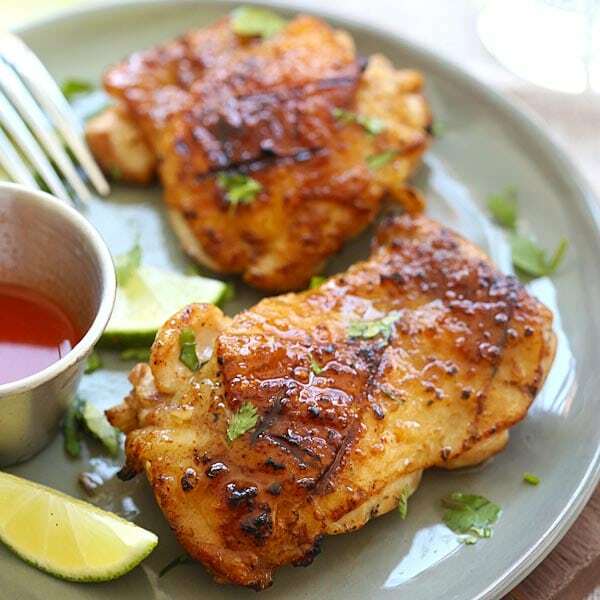 Your chicken ginger and garlic drumsticks were greatly received by every one and this will make a nice change from the spicy potato wedges I normally serve. I think a video would be awesome! Hi Mindy, I hope to have videos up soon! Tried it for Easter, what a success! Tottally gone ( huge pan) and everyone complimented it. Thanks for a great idea. Thanks Borjana for trying my garlic herb roasted potatoes recipe. I love this roasted potatoes. I followed the recipe exactly with red potatoes and they were nowhere near cooked enough after one hour and lacked flavor. were done cooking. They were delicious. I would have added chopped bacon I’d had any available. Thanks for the recipe! Awesome, so glad that you tried out my Garlic Herb Roasted Potatoes recipe.